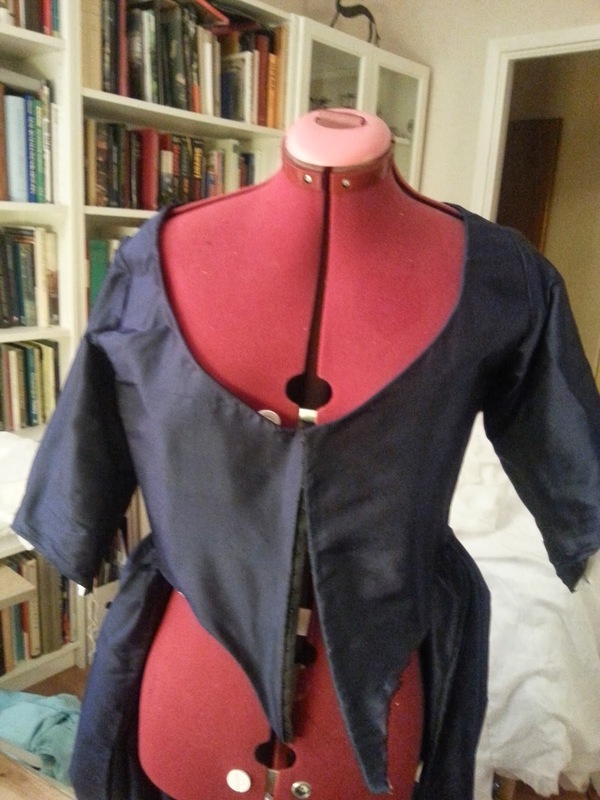 As mentioned in my posts about my other two robe anglaises I had a big problem with the sleeves. For Snow White I wanted that fit well and went down to below the elbow. I also knew that some day I want to make a gown with a full length sleeve. So for the first time in a really long time I decided to take my time and draft a pattern that fit me, and that I would be able to use for other projects as well. I didn't start from scratch though. 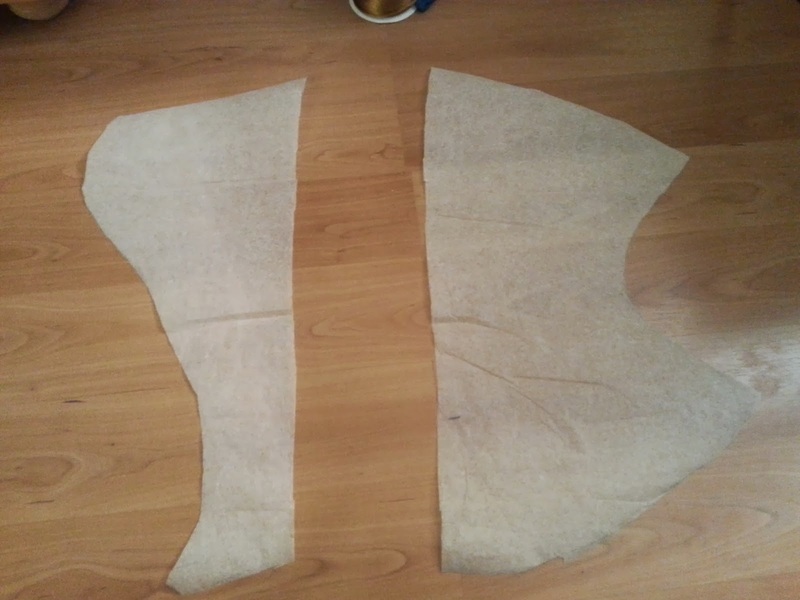 To the left is the lining of the sleeve for my 1760s jacket, that i ripped out, and to the right is my modified sleeve pattern for the RH822 gowns. The 1760's sleeve had a good size and the other one had a good shape, but was too big in the sleeve head and too short after my modifications. 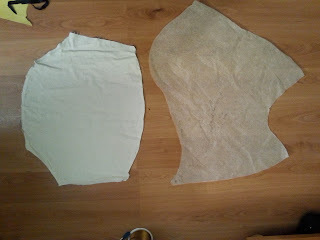 I measured the length of the sleeve head from the good fitting sleeve and put markers on the good shaped sleeves. Then I took a good look at the sleeves in Arnold and freehanded a line that followed both the markings and the shape of both sleeves. The sleeve was still too short though, so I cut it in half and spread it out, I think I added around 10-15 cm. 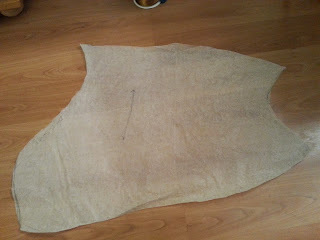 This is the final pattern for a full length 18th century sleeve. I didn't just measure though. It took a lot of pinning and marking with pen until I had a good fit. The resulting sleeve goes all the way down to my wrist, is shaped so it doesn't just hang straight down but has a nice curve, and I have no problem getting my fat over arms into it. Here are the sleeves attached to the bodice. As you can see these sleeves are just 3/4 sleeves. In order to shorten them I folded away the middle of the sleeve pattern above, so I would keep the curves at both ends of the sleeve. Still I'm happy with the sleeve pattern, and this one of the most self drafted pattern pieces I have ever made, so it has given me confidence in trying to do more of that in the future, as well as managing better with scaling up patterns from books.